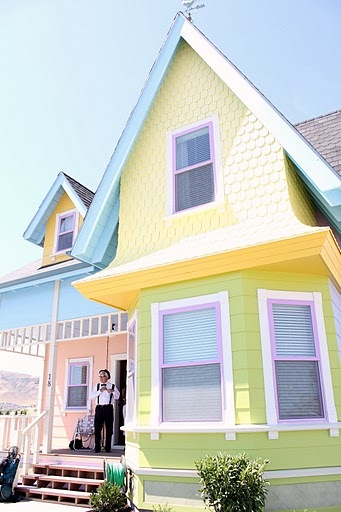 Last month when I told you about the real-life “Up” house that Bangerter builders created in Utah, the interiors weren’t finished yet. I asked if there were any readers in the area who might be able snap photos of them for us during the Salt Lake City Parade of Homes tour and a couple of them came through for us! 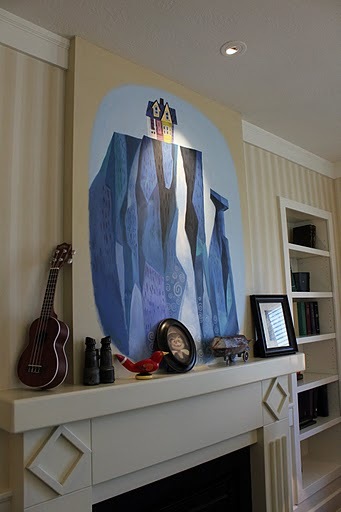 Disney allowed them to create the house on the provision that it could only be built once. 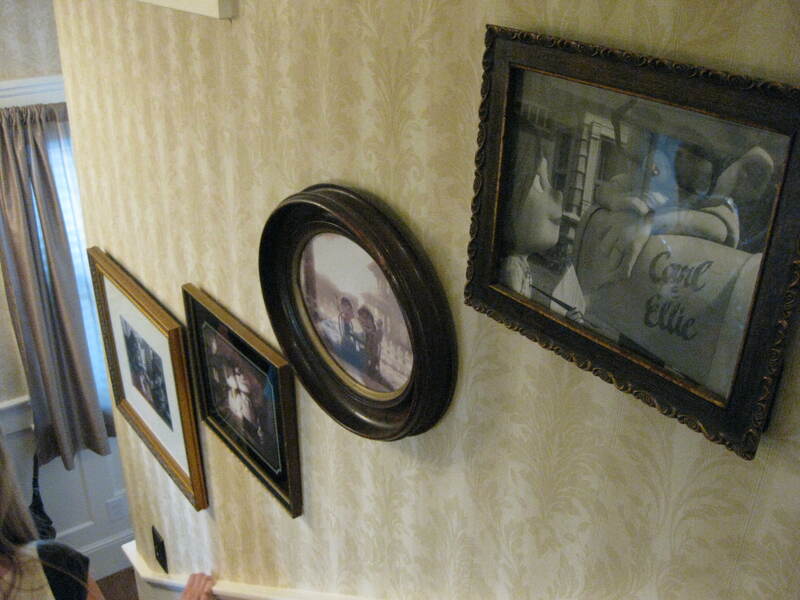 I love the photos that go up the stairs. 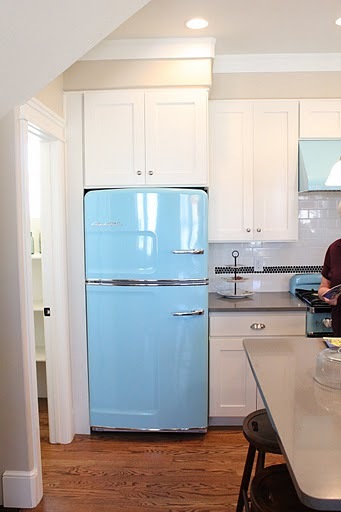 Gotta love those baby blue Big Chill appliances! The house was so crowded with visitors that it was a challenge for Emily and Kristen to get photos of the rooms, but they did a great job. Let’s check out the second floor now, shall we? It’s for sale for $399,900, but the builder will build the 4 bedroom, 3.5 bath house (not in “Up” style but with the same floorplan) for $299,000. The builder says it only took them 4 months to build the house. 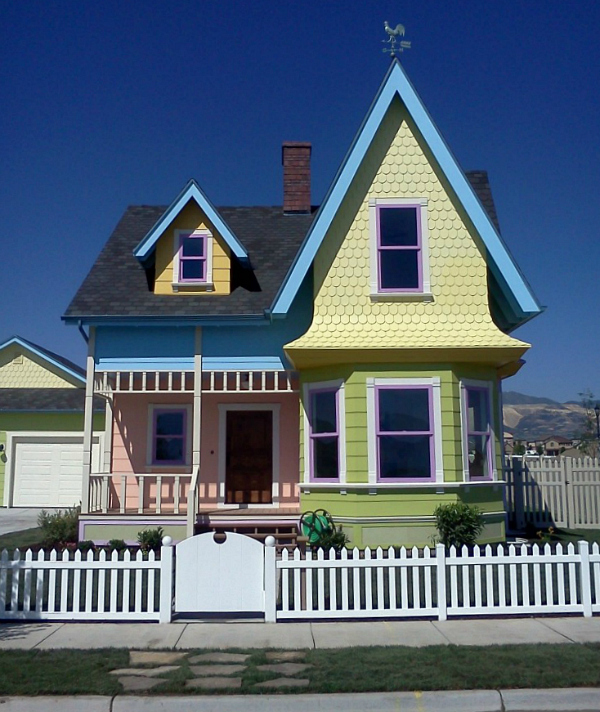 After I wrote about this house in July, readers from Herriman told me that the neighborhood was insisting that the house be painted beige or something “normal” after the home show. Boo! Many thanks to Kristen and Emily for taking the photos and sharing them with us! 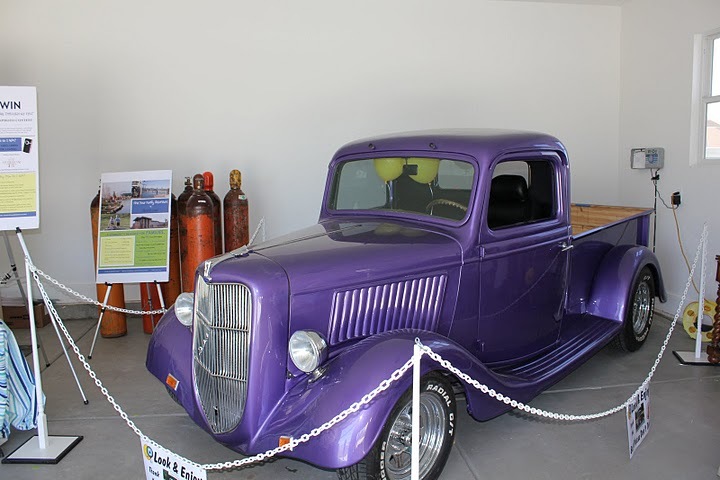 Read more about the house in my first post about it and at Bangerter Homes. Jennifer Lopez's Brownstone in "The Back-up Plan"
Just looking at these photos makes me want to cry again! UP was definitely one of those movies wherein my son looked at me to see if there were tears in my eyes–but there were tears running down my face! Such a sweet, poignant film. These builders have done a great job of recreating the house. 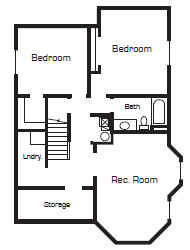 And it’s really a very nice floor plan. Sometimes I think we’d all be better off if houses today were more like those of yesteryear. I think our stuff has expanded to fill our larger houses! Thank you for sharing the photos! When I think of the movie, and look at the photos, I am reminded that it doesn’t take a large, expansive floor plan to have an adorable home! Every home tells a story, every home gives away secrets about its owner’s. I love the movie “Up”. 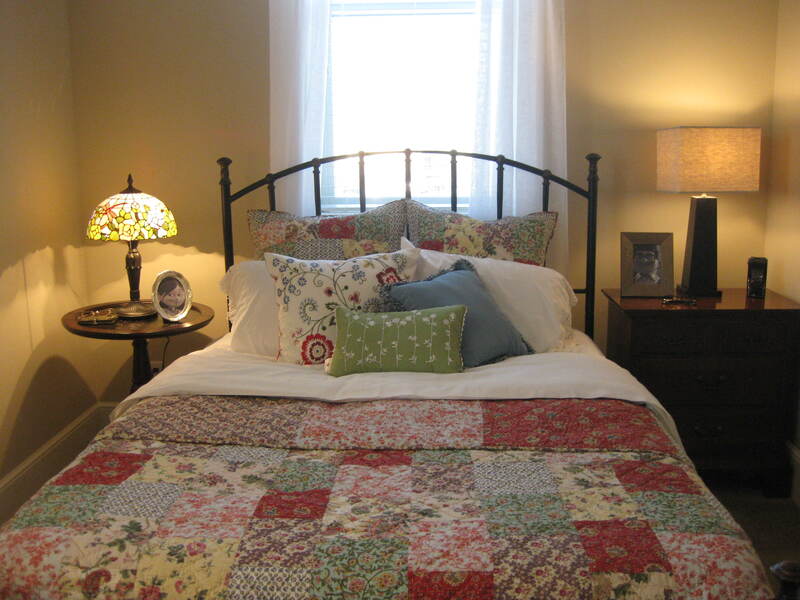 The home and it’s character’s tell about true love between a precious couple. Thank you again for taking the time to get the photos! This is just super! I’m so grateful for seeing these pictures! It’s definitely fun! I just love those appliances. Thanks so much for this one- its so much fun to see how much fun a house can be! I definitely want to see the movie now that I’ve seen how beautifully the builders have replicated the house. 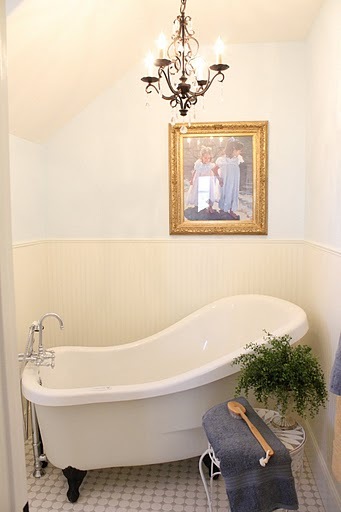 Every room has its own special charm but the one item I would love to have in my own home is that high back bathtub. I love this post! Love the house! Love the movie! What fun! Oh, how fun! I haven’t seen the movie b/c I don’t want to do the ugly cry, but I LOVE that cute little kitchen…even if they did have to imagine that one on their own. Neat tour! oh i loved that movie. wasn’t expecting it to be so relevant and real life. the sound track makes me weep like a baby! You Julia always bringing these fantastic posts. I enjoy so much reading everything you write. I just loved the movie and I would never imagine one would contruct the house! I’m loving those aqua appliances. What a fun change from all the ubiquitous stainless steel we are accustomed to seeing! 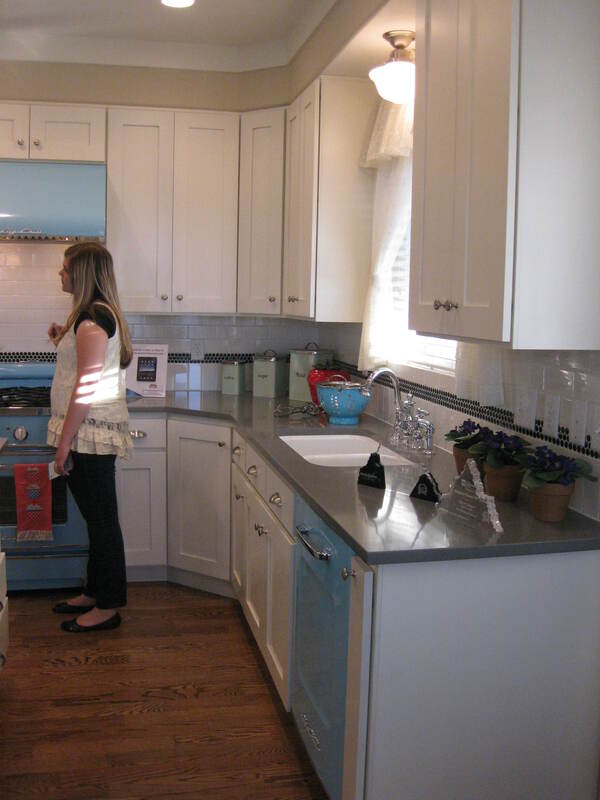 BTW, wondering if any readers that have toured the home can tell us the countertop material/color. In some photos it almost looks like stainless, but in others maybe a quartz product?! 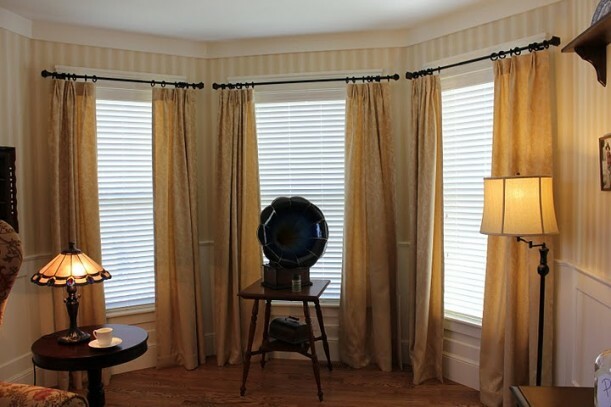 Maybe it was listed in the resources of the home tour info?! Thanks! I’m not 100% certain, I know it was a solid surface, for sure not stainless. It was so crowded the day I went that I couldn’t linger in any of the rooms too long! 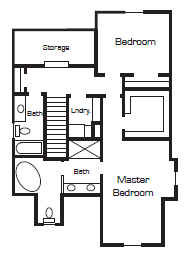 I kept having to repeat the floor plan to get better pictures! From what I remember they were more like Silestone. I looked in the book that they gave us at the house but it talks more about the movie than the finishes!! I adore the kitchen! I am so happy they were able to replicate everything down to the pictures! Fabulous! 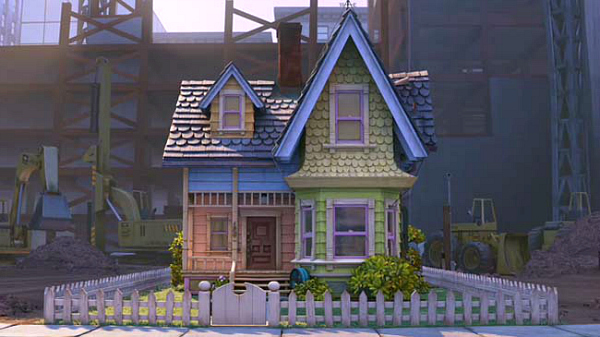 I saw UP and never want to see it again because it’s too sad for me, but I could move into that house in a heartbeat! Oooh – so fun. 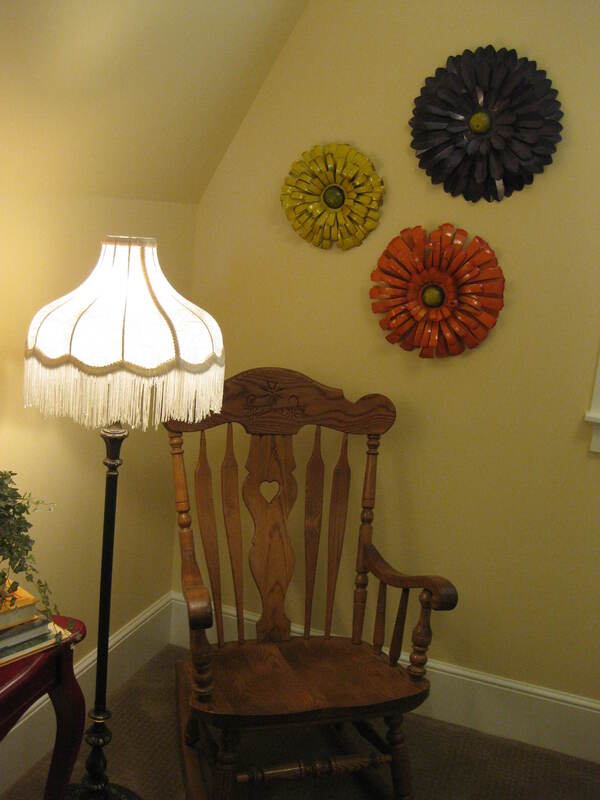 Love the giant metal flowers in the rocking chair picture. Would love to find them. Googling giant metal flowers now! Julia this is so wonderful!! 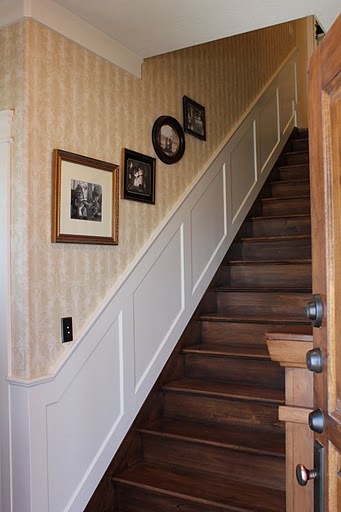 The wall paintings, amazing, the blue appliances, the wainscoting up the stairs. A surprise indeed! Loved the movie and love the house. 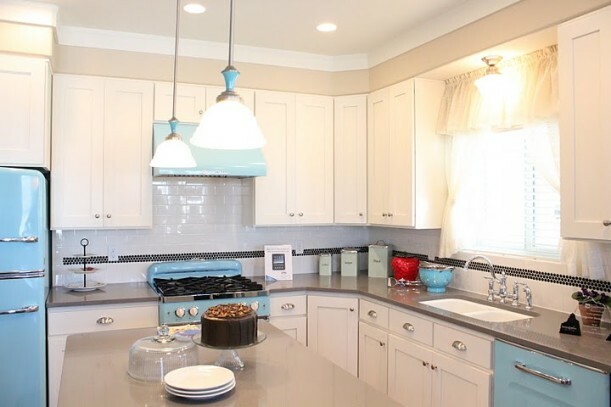 Those blue appliances are to die for! Thanks everyone for the photographs. I happened to be in Salt Lake the day the house opened and made a point to go out there to see it. 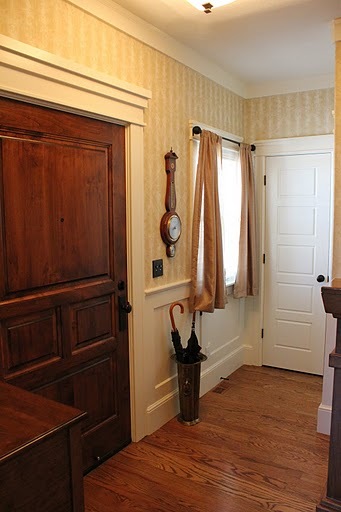 It is utterly charming and they didn’t miss a single detail in re-creating the house. I think the kitchen was from Ikea. I saw the exact same countertop material there. It’s some sort of solid surface, but I didn’t make note of the brand. I was really impressed with the look of it. Thanks for posting the pictures of the interior. I absolutely loved them! I enjoyed seeing all the details from the movie. My favorite room by far though was the kitchen. The blue appliances were a showstopper! What fun! 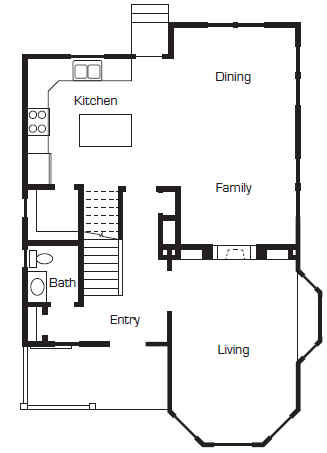 I especially love the kitchen. My father has a 1953 Oldsmobile that is the exact color of the appliances. What a fun and gorgeous home! I love that they didn’t leave out any details from the movie and that they aren’t going to paint over the colors. I want a stove and fridge like that! 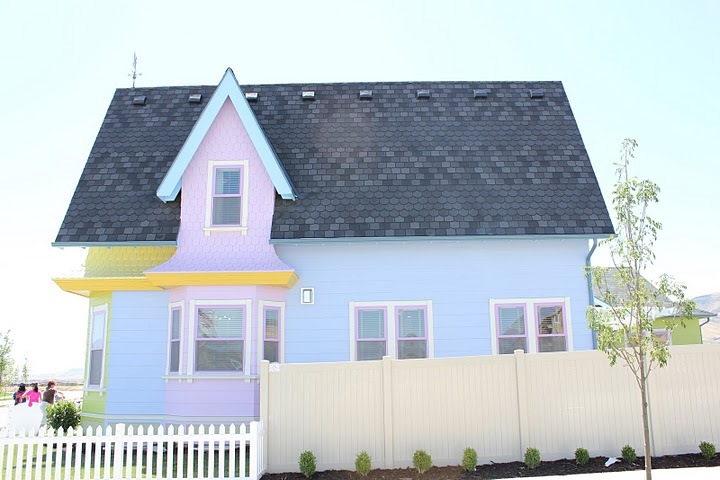 Cute house, I love it when people build things like this. This house is fantastic! Love this post, Julia! I can always appreciate an attention to detail, and this house is no exception. 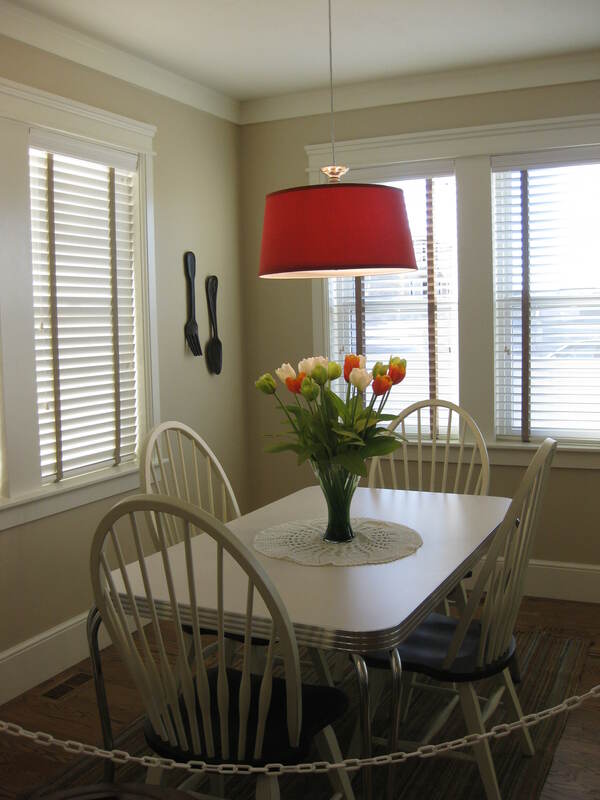 I love the cheery colors used, the whimsical furniture, and I ADORE the kitchen! 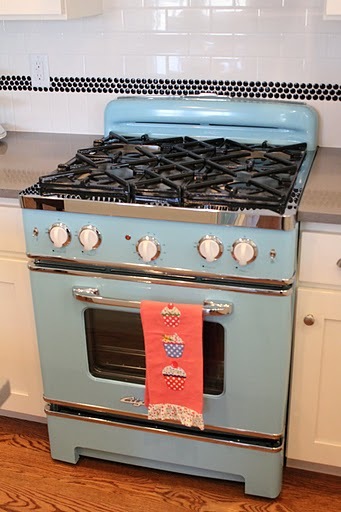 Those baby blue appliances are awesome! I loved this post! And just so ya’ all know… that is my dream kitchen. Yes, it is. Love. It. Hi Julia – what a beautiful home and what a wonderful movie. I have lost count of how many times my son and I have watched this movie it has the same effect on me everytime. Thank you for sharing and thanks to Emily and Kristen. Regards Esther from Sydney (almost springtime). I love this house. 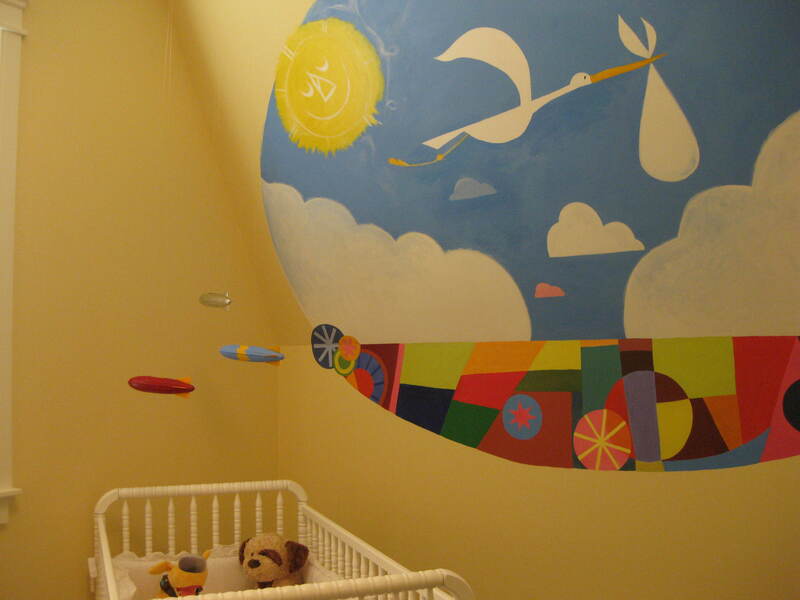 The perfect blend of function and whimsy. This is the coolest post, and I love the kitchen! I have been on break, Julia, but it is good to be back. I have missed some of my favorite blogs so, so much!!! When my daughter and I toured the home, not only was “Carl” on the porch to greet us all but also the Boy Scout and backpack. “Carl” was friendly and no doubt is in hundreds of pics taken during the home show. It was the highlight of this year’s show! I also got to see this home on the Salt Lake Parade of Homes, plus it’s just across the field from my brother’s house in Herriman. 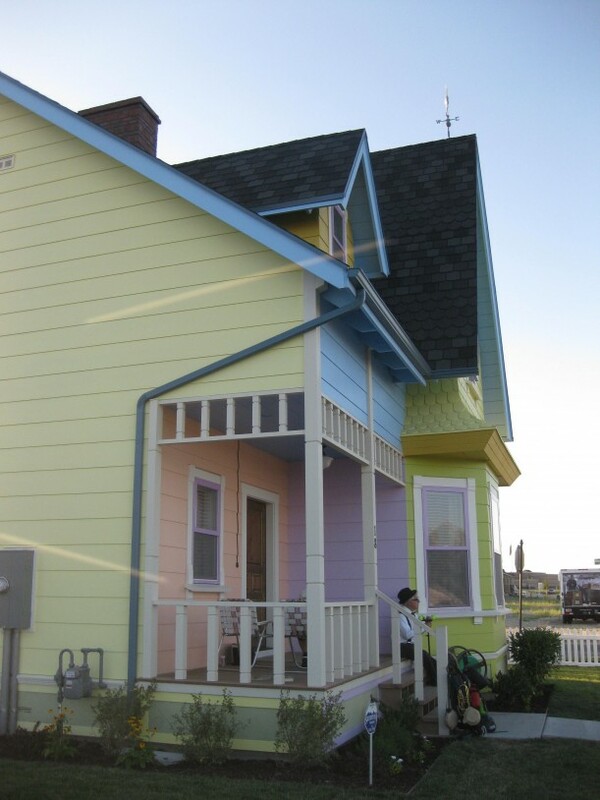 It does seem a little unusual to put it in a development with all these other natural and brown colored houses. I wonder why they didn’t choose to put it in the Daybreak development just a few miles away, which has a much brighter color scheme and more classic architecture. Maybe they really wanted it to stand out? 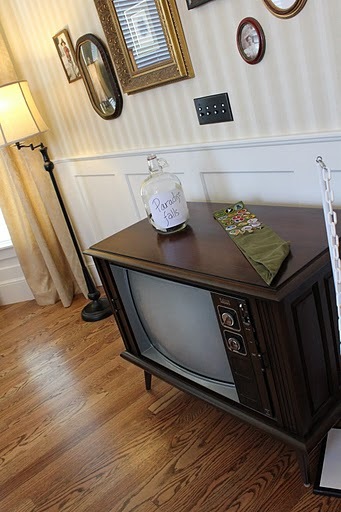 A couple more details about the house–they had two bedrooms in the basement, one decorated as a Disney princess room and the other as a re-creation of Andy’s room from Toy Story. I have pictures on my blog if anyone wants to see them. 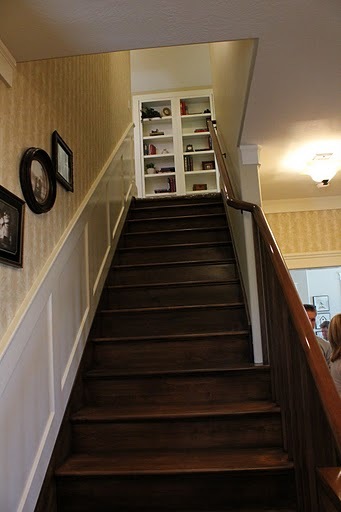 Also, I happened to be there just as the builder was showing people that the bookcase at the top of the stairs has a secret storage compartment behind it! 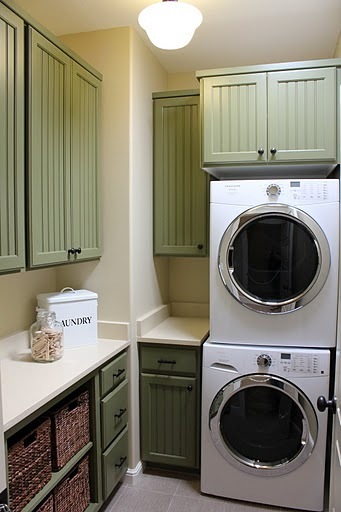 The shelves just pull open like a set of french doors to reveal a big closet space behind it. I bet they had a lot of fun building this house! Loved the movie, but I was expecting floral wallpapers and chintz to go along with their older ages. To me, the kitchen looks too modern, although I do love those blue appliances. I have some of those in Yoville! 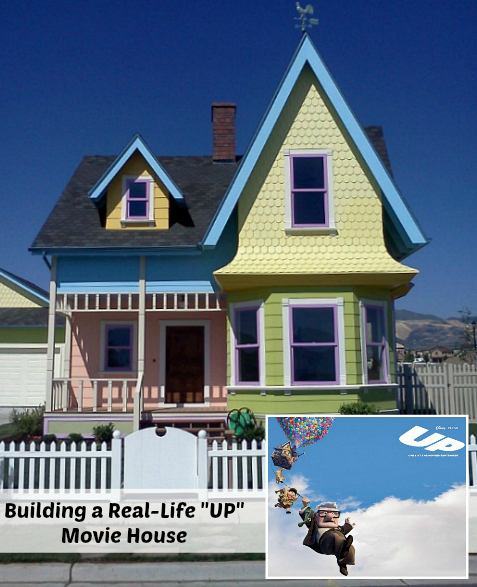 When I was visiting in Utah a couple of weeks ago we were able to go through the “Up” house with my daughters and nieces and nephews. It was so much fun and the house was adorable. They even had cotton candy and ice cream for the kids afterwards. 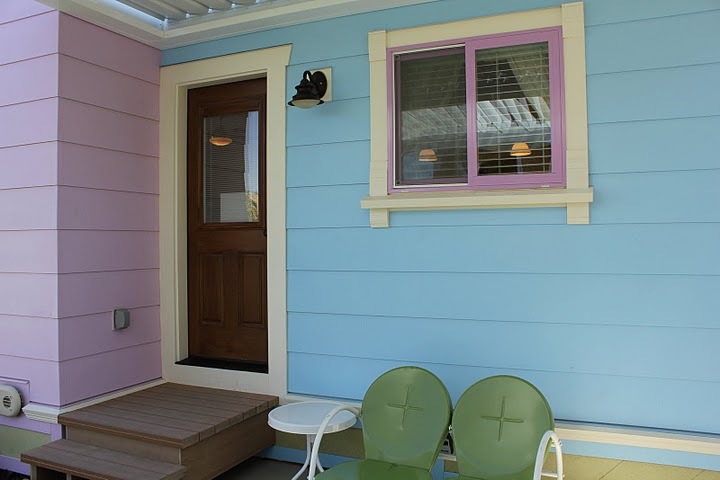 I’m going to be posting more pictures on my blog soon, with the paint colors – they were oh so fun! Oh my gosh this is absolutely adorable!!! And what a great replication! I’m in love! 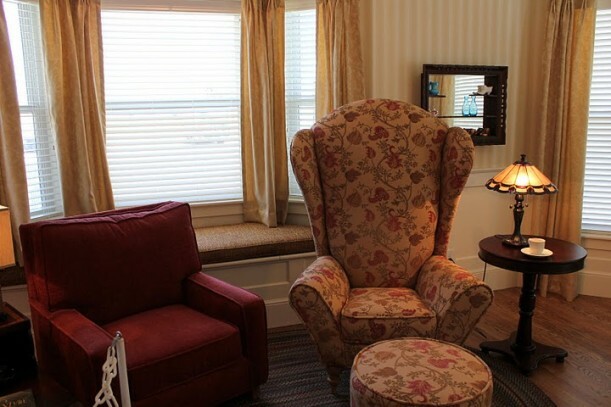 I went inside the house for the home show and it was had such a sweet happy feeling inside. I loved it. I felt sad for all the drab brown and beige houses all around it. Oh, how delightful! I am amazed at how well they recreated it, right down to all the little details. Impressive, indeed! Thanks to you – and the other ladies – for sharing the pictures! I’m just now seeing this and it’s so sweet it makes me want to cry. I loved the movie and the opening montage makes me weep every time I see it. 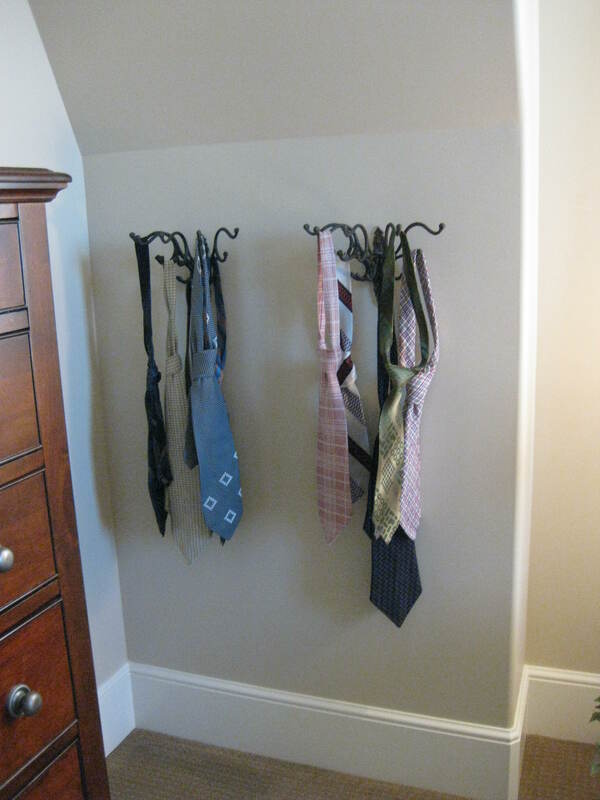 What a sweet idea. I want to live there! is there any tours of this house still? where is this house? My little girls would love to see it! Thank you for sharing this article. Found your website through a friends blog – https://www.gamesfor.co very informative and entertaining. Great Home, What’s with all the locks on the front door? i like this eille must have relly loved this house it so cool i wish i had the money for a houes. Found your blog in the AOL wholesale bulk t-shirts directory, very nice job, thanks.